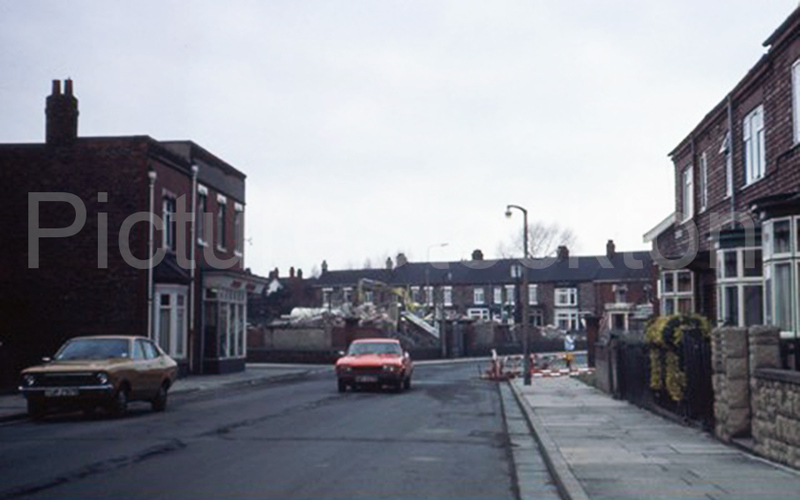 This photograph was taken in November 1980 and shows the demolition of Richard Hind Senior schools to make way for new housing. I attended both the junior and senior schools between 1953 and 1964. Photograph and details courtesy of Ian Pirie. I lived in the last house on the right of the picture and attended the junior school until 1952 a lot of my friends went on to the Senior School and it was sad to see the demise of a school which turned out some very able people. The writing was on the wall for Richard Hind in the mid sixties. By accident, one summer’s day I ran into Mr “Johnny” Rosser in Smiths in Stockton. He was in a very emotional, almost tearful state. His wife was with him, who kept apologising for her husband, asking me, someone barely into his twenties, for sympathy. I gathered that something dreadful was happening, but whether it was to him or Richard Hind was not made clear, probably both. The comprehensive tide was sweeping the country, and an oddity of a school, like Richard Hind, which took partial failures from the “11 plus” and pushed them towards a good technical career, had not chance of proper consideration. It was only with the passage of years did I realise that everything that Rosser had strove and fought for was being cast aside. The school had some difficulty in getting the right calibre of teacher, but I can honestly say that there were only a few deadheads. Only a few boroughs adopted the three tier set up of “Secondary Moderns” ,”Technical Schools” and “Grammar Schools”, which must be another reason why they were bulldozed out of the way. I have to laugh that “good sound technical education” is again being called for as a solution to England’s poor rate of industrial development. Ian Pirie, are you Valerie’s brother? Yes I am, I took this photo from outside our house in Richardson Road where we lived from 1953 to 1970. Even though I lived so close I could still be late for school. I attended from 1956 to 1962 and was known as Edmund Todd (my first name is Sydney and I now live 100km north of Sydney in Australia). I have been trying to contact old school mates but no success. Just wondered if you knew of any Facebook or other social media groups to check out. Hi, you were a little time after me if I find anything will let you know, did find a few on Friends Reunited about ten years ago. Hi, I was in juniors 1953 to 1957 along with John Watson, Tony Bird, Susan Dumont, Pam Dinsdale, Pat Thomas can’t recall any more, if anyone else can? Being an ex-pat of more than sixty years, and also being an old-boy, might I ask the reason behind the school’s demolition? I must say that upon returning “home” several times over the years I never failed to make a nostalgic pass by the school.